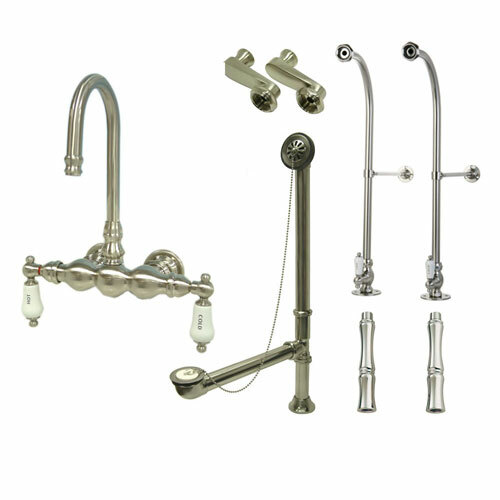 This Freestanding Floor Mount Satin Nickel Hot/Cold Porcelain Lever Handle Clawfoot Tub Filler Faucet Package 3T8FSP is sold complete and is fully ready to install with your Clawfoot or Freestanding Bathtub. This Floor Mount Freestanding Tub Filler Faucet Package Kit includes the Faucet, Supply Lines, Tub Drain, and all other required hardware. All fixtures come in matching Satin Nickel Finish. Note that although there may seem to be variations in the finish as it appears in the product photos, in reality all components of this package will match each other perfectly. This difference is caused by lighting and photography issues and NOT by differences in the finish of the products themselves. Using our 40+ years experience in the plumbing industry we have put together these packages to simplify the buying process.